From Saratoga County south to New York City, residents of eight municipalities along the length of the Hudson River will light candles at vigils next Thursday, July 23rd, as part of our call for General Electric to keep its PCB cleanup going past the end of the year. Will you join us to light a candle? The Candlelight for a Cleaner Hudson events will begin on Thursday at 7:30 p.m. at eight locations all along the river’s shores. We’re inviting everyone who cares about the Hudson and its importance to waterfront communities and economies to participate. In other words, you and your family and friends! Here is a full list of candlelight vigil locations and contact information. 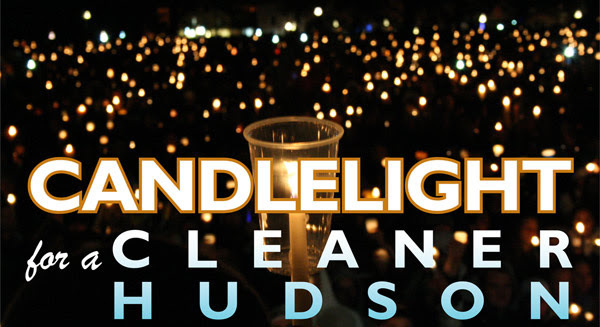 All vigils are on Thursday, July 23and start at 7:30 p.m. (You can sign up officially at the event section of the Campaign for a Cleaner Hudson page on Facebook.) See you there! Tell GE and our state and federal leaders to finish the job and restore the legacy of a cleaner Hudson River for future generations. Sign our online petition, volunteer and speak out! ← At The CENTER : Submissions for 2nd Annual Short Play Festival!